It seems to happen every time a march or protest takes place in London. 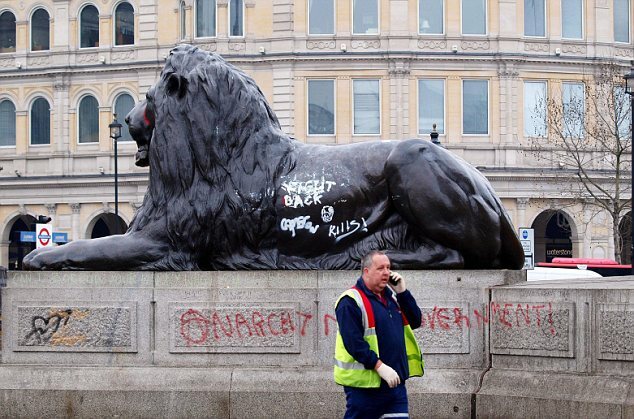 A much-loved statue or monument is defaced, horrifying the sort of people who are horrified by this sort of thing while the rest of us wonder why nobody’s got round to throwing a bucket of paint at that godawful Animals At War monstrosity on Park Lane. On Saturday, after the TUC and some kids dressed in black marched through the London to complain about stuff, it was the turn for the Landseer lions at Trafalgar Square to take a pasting. While the statue of Charles I received a more artful reimagining. 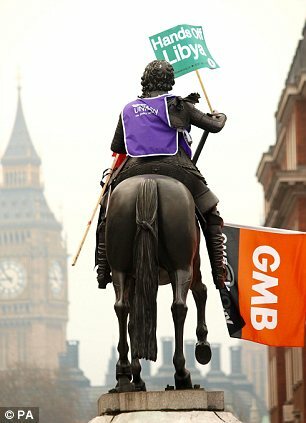 Interestingly, this Charles I statue had already been manhandled by the mob – albeit inadvertently – way back in 1867 when a reporter climbed the statue to get a better view of a passing protest and used the sword to steady himself. The sword promptly fell off and disappeared into the crowd, never to be seen again. Most people think that this habit of deliberately defacing certain statues is a recent thing, dating back to the inarguably splendid Winston Churchill turf mohican on May Day 2000. But the London mob has a rich tradition of dressing up (or down, depending on your viewpoint) London statues. 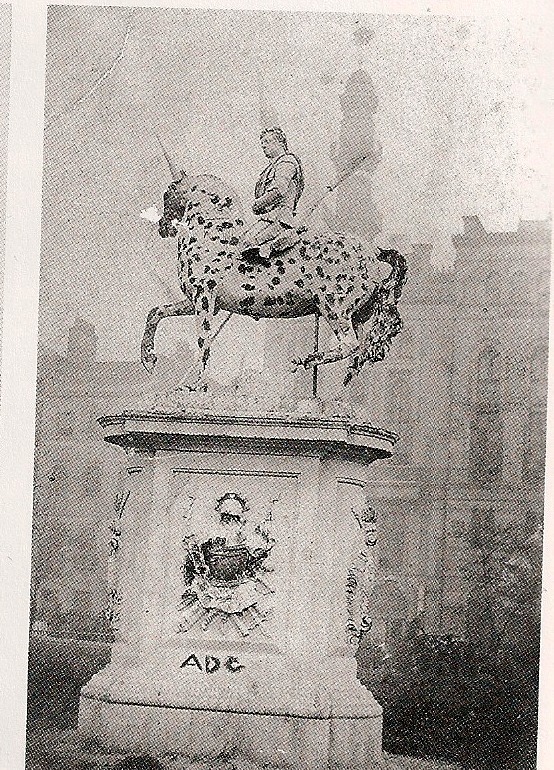 My favourite example is the treatment dished out to the statue of a mounted George I, which was cast in 1716 and placed in Leicester Fields in 1784. This received serious punishment over the years as children clambered all over it, so both horse and rider lost bits, and at one point the poor king was without head, legs and arms. But worse was to come. 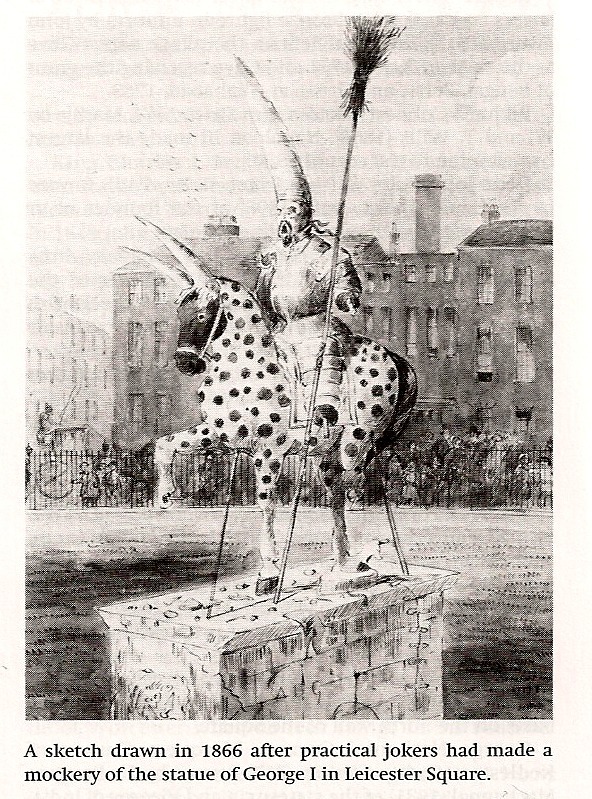 In October 1866, after the state of the statue had been discussed in the Times, guerilla jokers attacked the statue at night, painting black spots all over the horse, replacing the lance with a broomstick and putting a dunce’s hat from the nearby Alhambra Theatre on George’s bonce. Crowds flocked to see the spectacle. It was cleaned up, but eventually sold for £16 and pulled down in 1872.